“Well, if you want my opinion, Miss Shirley, I’d write about places I knew something of and people that spoke everyday English. Instead of these silly schoolgirl romances.” –Gilbert Blythe, Anne of Green Gables. Ever since I first saw Anne of Green Gables when I was eight years old, I have wanted two things: to be a writer and a redhead. I can’t really do anything about the redhead part, short of incessant maintenance and a really good hair stylist, but the writer thing I’ve been working on for a long time. You’d think based on the number of times I have read Anne’s story, I would have figured out the message L.M. Montgomery was passing along—that getting wrapped up in the delicious details, though beautiful, is not the thing. The thing is the people. The thing is the way time and travel and tragedy make you and me more tender and tough and human. Just like Anne, what I wrote when I was younger was always in beautiful, painstaking, poetic detail. The texture of the carpet under bare feet and the way the wallpaper was peeling back from the far left corner of the room, making it droop like a forlorn basset hound. Delicious, right? Admit it, you can totally picture both the saggy room and the saggy dog. What I didn’t know yet, was that a page of details is not enough. I didn’t know how to write about the people. My characters were flat and simple and relied on a storyline of being rescued—maybe from poverty, or abuse or even their own boring life. 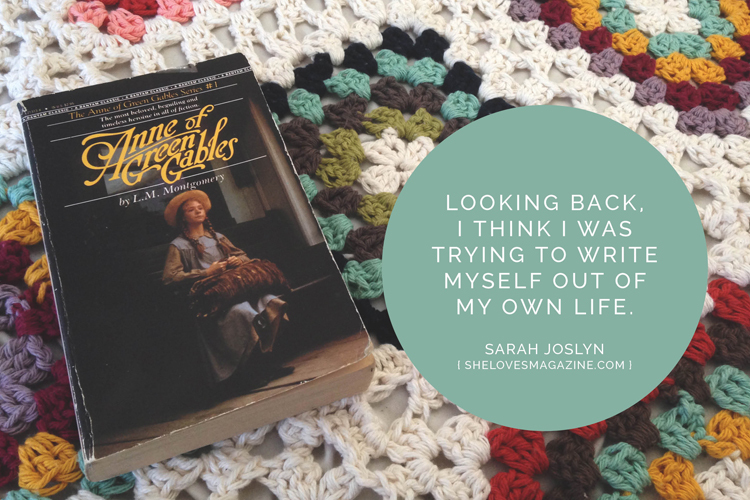 Looking back, I think I was trying to write myself out of my own life. I could figure out how to write about a new place in its entire sunlight-speckled minutia, but I could never quite figure out how to liberate my characters without drama and intensity. My friend Claire would remind me it is possible to write my way to healing. Maybe that’s what I was trying to do all along—maybe what I thought I needed was dramatic and intense. In college, I started writing about my own life and my own thoughts and the words came spilling out so fast, I just gave up on the excessive adjectives and gentle, lengthy paragraphs. I felt a need to communicate and punctuate and that gave me less time to chronicle the look of the wallpaper or the carpet. Sometimes, I still catch myself wanting to write whimsical bits of details. I catch myself spinning poetic lines about the crystal-glazed windows on all the cars that have yet to move this early autumn morning. And the way the fog settles in the Skagit basin covering everything but the jagged North Cascades that refuse to tuck under that heavy, misty quilt. I want to write about the man in the burgundy sedan with the shaggy hair who seems to be singing along to his favorite band for the entire hour we travel parallel to each other and the woman who I caught putting on her mascara while driving 70 miles per hour. I want to write about these tiny moments—about people I’ve never met and about the way that makes me feel. And I really believe in that. I really believe in the power of poetry and movement and those teeny tiny split seconds that can be spun into whole pages, because that is what writers do. But on the other side of things, I still need to communicate and punctuate. So I am learning the art of doing both and all the while I am trying to write my way into healing.